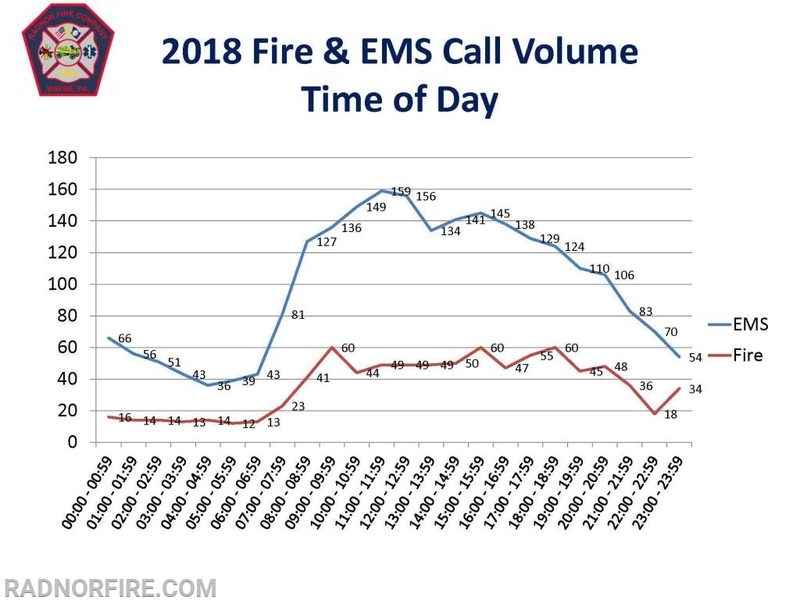 WAYNE, PA (January 21, 2019) – The Radnor Fire Company of Wayne (RFC) today released its 2018 year-end fire and EMS call volume numbers showing a five-year high for fire related calls and the second-highest numbers for EMS calls over the same period. Radnor Fire Company responded to 864 fire calls in 2018; 641 in Radnor Township, 121 in Tredyffrin Township, and 102 in other neighboring townships. RFC called for assistance from other fire companies 76 times and assisted other fire companies 119 times during the year. Total fire loss for Radnor Township in 2018 was $827,800 with the largest loss ($500,000) coming in May when the township’s brush tub grinder burned in a mulch fire at Skunk Hollow Park. Total fire loss in the section of Tredyffrin Township covered by RFC was $21,050 during the same period. 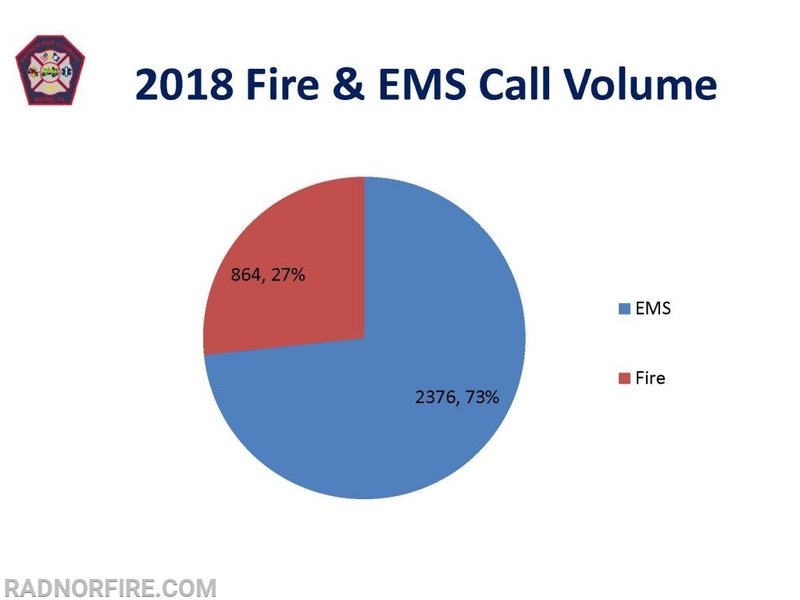 Radnor Fire company responded to 2,376 EMS calls in 2018; 2,058 calls were in Radnor Township, 172 in Tredyffrin Township, and 146 in other neighboring townships. The average time spent on EMS calls across all jurisdictions was 54 minutes, 36 seconds. The primary injury encountered across all EMS calls was falls followed second by motor vehicle accidents. The highest users of RFC’s EMS service was by persons 85+ in age, followed by 75 to 84 year olds and 55 to 64 year olds. 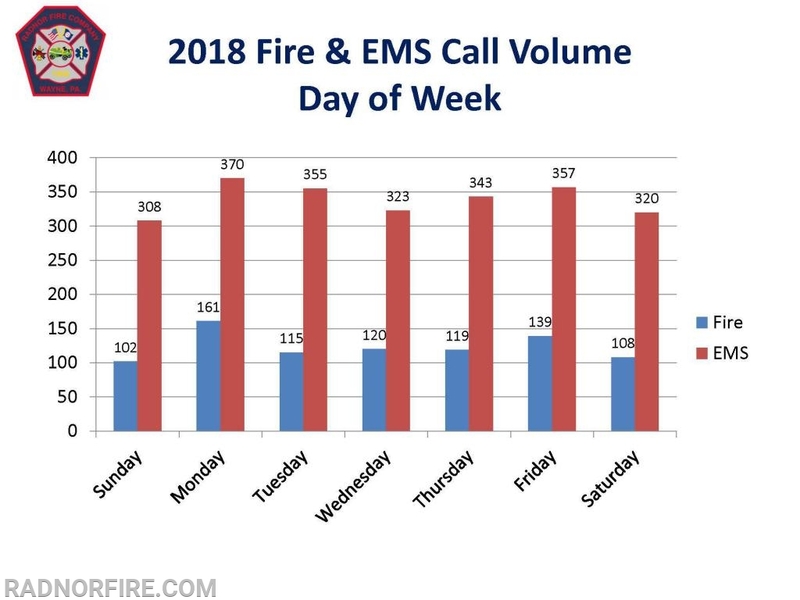 According to Brazunas, in 2018, Monday, Tuesday and Friday showed the highest call volume for both fire and EMS. 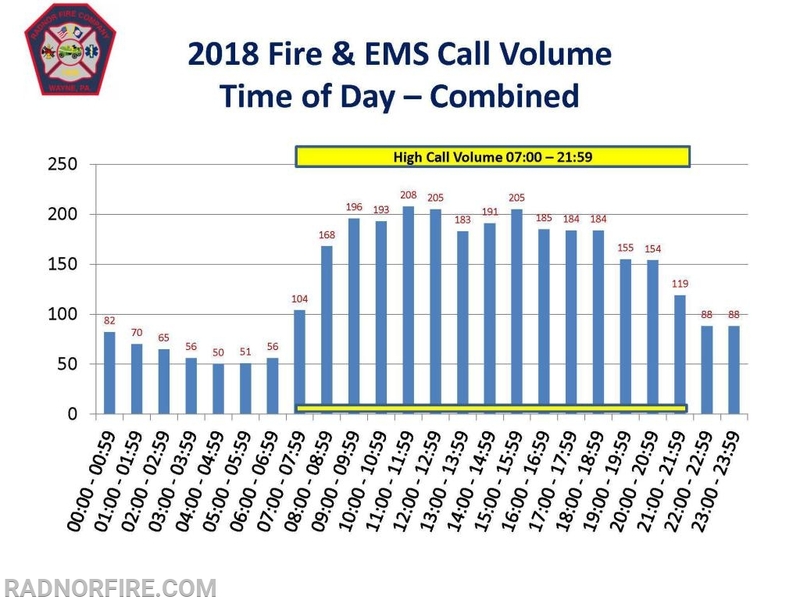 During the day, the combined call volume responses rise steadily from 7 a.m. to noon, and peak from 11 a.m. to 3 p.m. 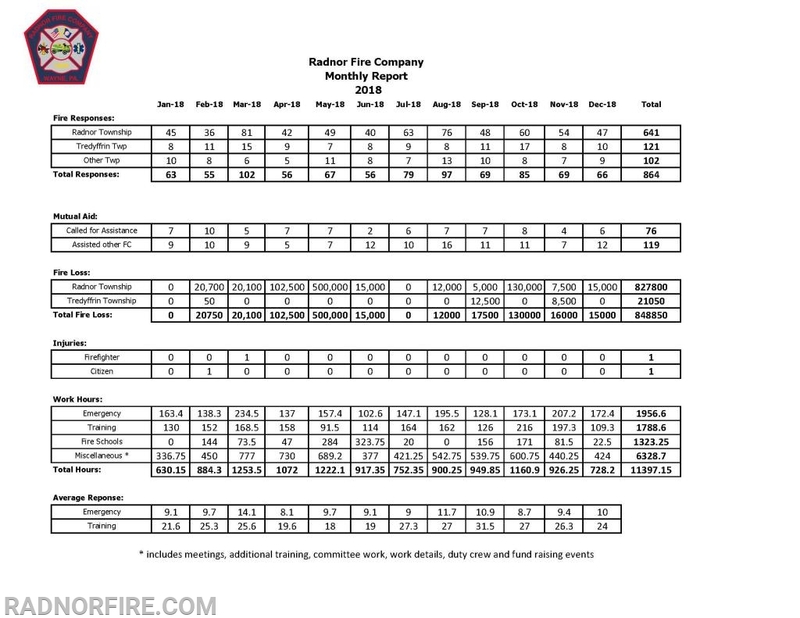 The members of Radnor Fire Company volunteered a total of 11,397 work hours in 2018. Emergency responses accounted for a total of 1,956 volunteer hours. Total training hours worked by volunteers was 1,788 hours, and volunteers spent a total of 1,323 hours attending training classes at local fire schools in Delaware, Montgomery and Chester counties. Miscellaneous work hours on administrative, fire house, and fire prevention activities by volunteers accounted for 6,328 hours. The Radnor Fire Company of Wayne, Inc. (RFC) was founded in 1906 and is located at 121 S. Wayne Avenue in the heart of Wayne. RFC protects the largest fire district in Radnor Township, Delaware County, while the EMS service covers the entire township. RFC also responds to the eastern portion of Tredyffrin Township, Chester County as the primary Fire/EMS provider. The company provides fire suppression, rescue, basic life support, and advanced life support medical services to more than 35,000 residents across Radnor and Tredyffrin, and more than 8 miles of I-476.